Editor's note: It looks like Scott had another good French dip, a 4 of 5 in Charotte, NC. Here's his very positive review! I've been a Charlottean for 17 years. I've passed by the three locations of The Steak 'N Hoagie probably hundreds of time. But I'd never felt inspired to check it out until a coworker of mine said it was a good place to get a delicious Philly Cheesesteak, and very affordable. So last week I took the plunge. I arrive at this mostly take-out joint, and see on the menu a Philly Cheesesteak Au Jus. I was in awe of the idea. It's like my two favorite sandwiches in one. So of course, I skipped the regular cheesesteak that they are known for and went with the "dip" version. First off, this place is cheap. Really cheap. It was $4.75 for the sandwich and I decided to go with double meat for an extra $1.75. Added a side of pepperoncini peppers for $1.50. "I came back to my office, and unwrapped the best hidden secret in Charlotte that I've found in a while." I came back to my office, and unwrapped the best hidden secret in Charlotte that I've found in a while. A meat-packed sandwich with melty provolone on a soft hoagie bun. Though the bun was soft, maybe not French Dip material, it was still fresh and delicious. 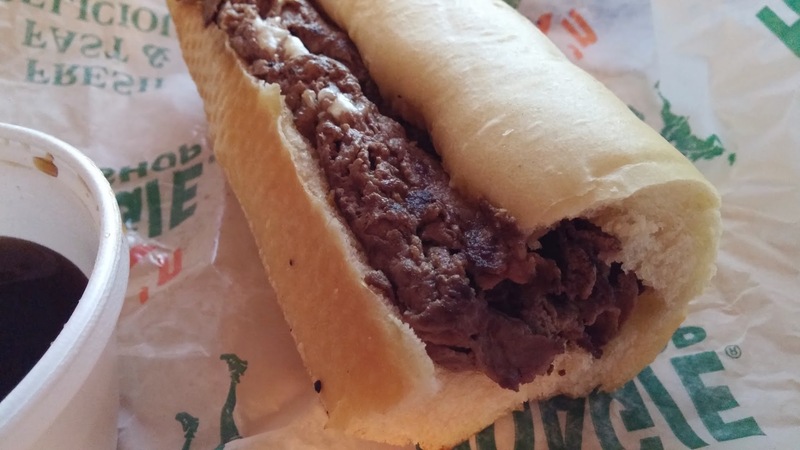 The meat was just what you would expect in a Philly: thinly sliced, finely chopped, and with crusty bits of goodness throughout. 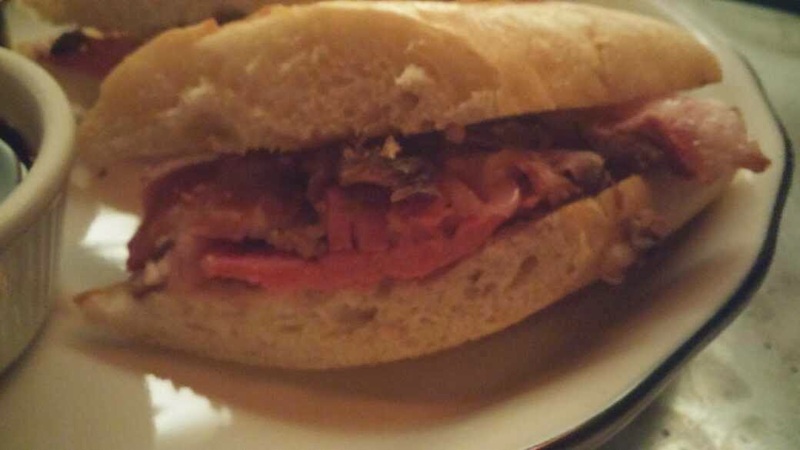 The meat was just what you would expect in a Philly. Thinly sliced, finely chopped, and with crusty bits of goodness throughout. "So of course, with this place being a cheesesteak place, and not necessarily a French Dip place, I had low expectations of the au jus." 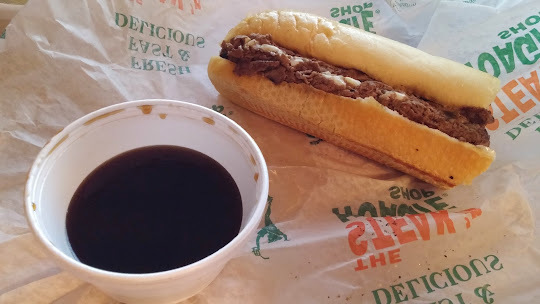 So of course, with this place being a cheesesteak place, and not necessarily a French Dip place, I had low expectations of the au jus. But I was so pleasantly surprised when my styrofoam cup plentifully full of au jus contained a wonderful, dark jus with a ton of flavor. I thoroughly enjoyed the sandwich. Throw it on a French roll and it's a solid 5. But unfortunately that isn't an option. "I now can see myself hitting this place up on a weekly basis to fulfill my endless French Dip cravings for a measly $4.75 to $6.50 if you want extra meat." SideDoor is a restaurant owned by the Lawry's Group, but it sure doesn't feel like it when you step in there. I'd been looking for a good Gastropub in the neighborhood of my hotel, and I had decided SideDoor was a must-do given the comments on Yelp about the French Dip. But when I found out that Lawry's owned it, it lost a bit of the appeal - I typically prefer non-corporate, local joints. But hey, there are only two SideDoors in the country, so I decided to try it out. 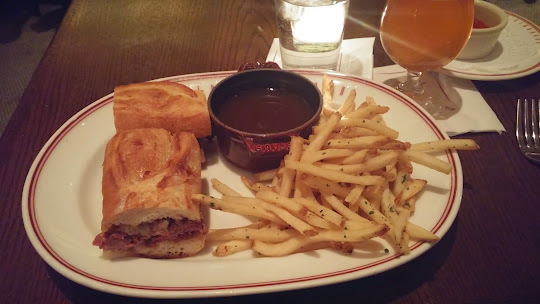 The French Dip at the SideDoor doesn't come with any sides, and it's $18 - one of the pricier French Dips I've had, and once you add a side, it might be the most expensive I've had. Two beers and a bowl of chili as a side (who needs veggies?) led to this being a $63 meal for basically a sandwich/soup/two drink meal - it's up there on the price scale for sure, for a sandwich. But, for that price, you get an excellent French Dip. The bread, baked daily in Wicker Park at the Red Hen Bakery, was just perfect. Fresh, slightly crusty, but not too much, and flavorful. The bartender gave me the choice of how well done I wanted the prime rib, which I thought was key. 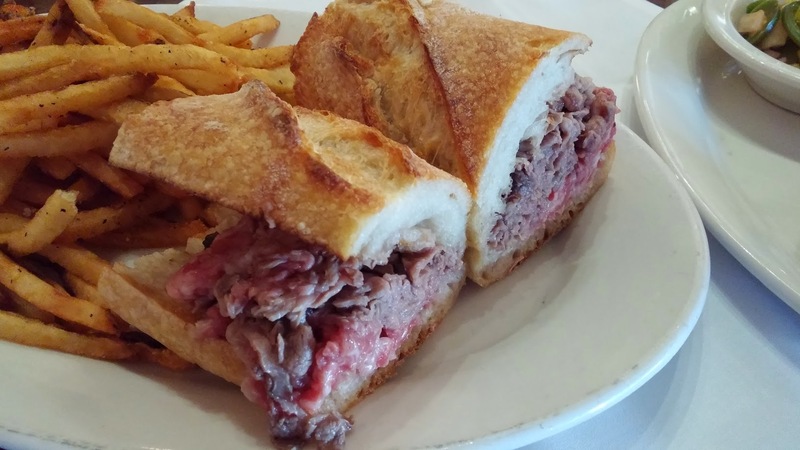 I prefer meat that is more done in my French Dip than I would typically order for a steak. I went with medium, and that was perfect - a bit of pink, and a bit of crusty goodness, giving the texture of the beef a good balance. If anything, I could have had a bit more beef, but it wasn't lacking by all means. "The au jus was just wonderful"
The au jus was just wonderful, though the portion wasn't enough. So I asked for extra, and the bartender brought more with no hesitation. Just the right amount of sodium, and just the right consistency. There's a small margin between too watery and too soupy for au jus and many restaurants just can't get it right, but this au jus had a bold beefy, oniony flavor and was in that consistency margin of au jus perfection. They also include creamed horseradish, and while I typically prefer raw/dry horseradish, I really didn't have any complaints. No, that's not something living in the au jus - just a reflection from the lights over the bar. I've had probably hundreds of French Dips all over North America in my time traveling, but I must say that this ranks in the top 5. Well done, SideDoor. While on a business trip in blustery Chicago, enduring a -20 degree windchill, I knew just what could warm me up – a good French Dip. So after a bit of scouring around for a place not too far away from my hotel (so I didn’t get frostbite), I found Gibson’s. 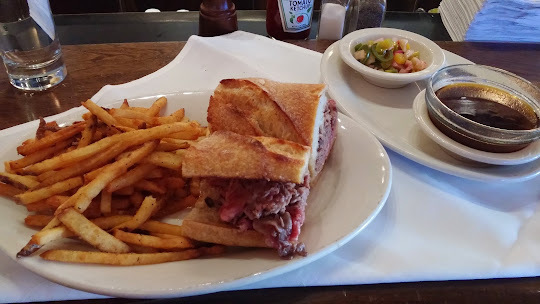 Another reviewer online claimed it was the best French Dip he’d ever had, so that sounded like the place for me to check out. Gibson’s is a high-end steakhouse with high-end prices. 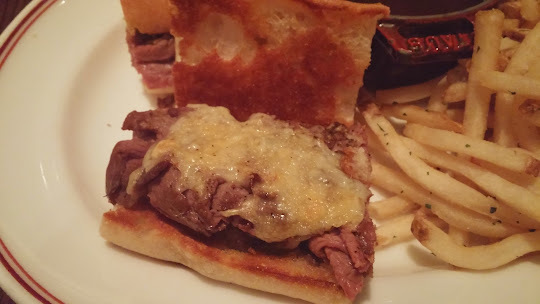 Steaks range from $41 - $100, so it was no surprise to me that this one be one of the pricier French Dips I’ve had. But from the amount of beef in the sandwich, $16.25 really wasn’t that bad of a price. The beef used was Gibson’s cooked-daily shaved prime Rib, mostly medium-rare. I must admit that though I am a rare-to-medium-rare steak eater, I prefer the meat in my French dip to be a little more thoroughly cooked, though. Maybe I’m the weird one in regards to that. The bread was true French bread, and you could tell it was freshly baked. It had a nice crust on it, but not too hard – just sturdy enough to keep the sandwich together when dipping. The au jus was presented in a large, hot bowl on its own plate, along with various peppers, which I didn’t use to top my sandwich with. I chose rather to top my sandwich with a bit of dry horseradish – they offered both, creamy and dry. 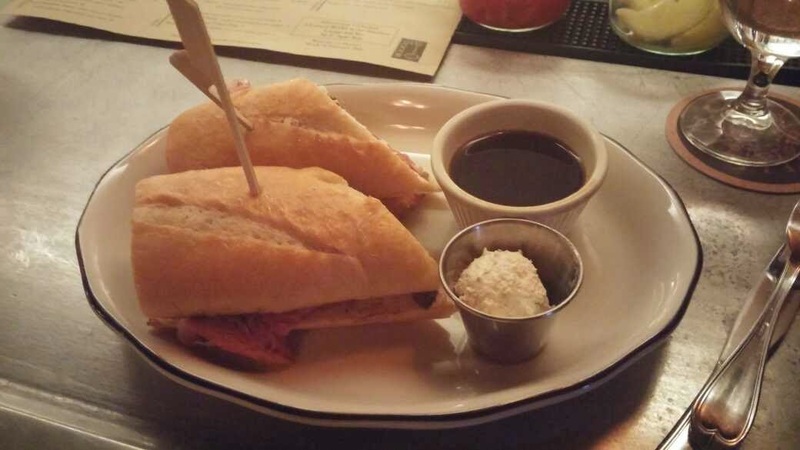 The au jus amount was plentiful for dipping through the entire sandwich. 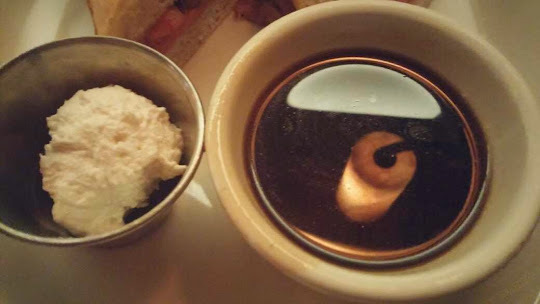 "It lacked the salinity expected in a good au jus, and I felt that the right density of the beef broth/stock was just not there." As I got ready to take my first bite, I was really anticipating that this would be a winner, but the au jus was a major let down. 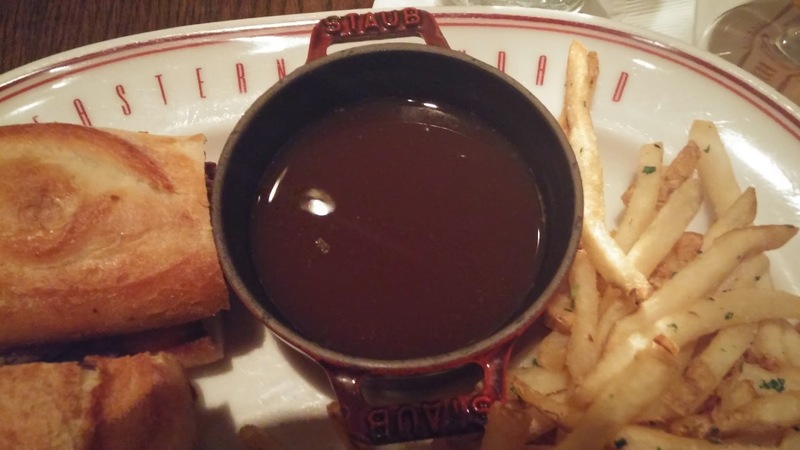 It lacked the salinity expected in a good au jus, and I felt that the right density of the beef broth/stock was just not there – it was like it was watered down. The jus overall had just very little flavor. More or less I felt as if I was just eating a prime rib sandwich dipped in light brown water. I added salt to the au jus, but salt can only go so far. Nevertheless, the sandwich was still a winner. I don’t regret it. If the jus were a little darker, with more of that beefy flavor, it would have been a strong contender for a “5.” If it were just a prime rib sandwich, it would receive a “5.” But being that this is a French Dip blog, and as the only thing that constitutes a French Dip being a French Dip is, for the most part, the inclusion of the au jus, it just doesn’t all come together to make a good French Dip.